Suppose a heavy cargo ship hauling ore collided with a tug and barge offshore from Admiralty Island National Monument? First responders from the state and federal agencies held a two-day simulation this week involving a maritime collision near Hawk Inlet. The scenario is based on real conditions: every three to four weeks an Asia-bound cargo ship is loaded with ore from Hecla Greens Creek Mine. “They have both heavy fuel and marine diesel and in this particular incident, it was heavy fuel that spilled,” said Scott Jones, a spokesman for international shipping company Oldendorff whose bulk carriers routinely haul ore concentrates. The April 2-4 simulation describes an early morning collision between one of the German company’s bulk carriers and a type of tug-and-barge common in Southeast Alaska. “The tanks that were damaged had a capacity of about 220,000 gallons and the estimate is about 190,000 spilled,” he said. It’s only role playing. Environmental war gaming. No actual oil spilled. But 110 people from state and federal agencies and relevant industries assembled inside the University of Alaska Southeast’s recreation center on Thursday in Auke Bay are acting as if it had. These are the same people who would be responsible for responding if the spill was real. 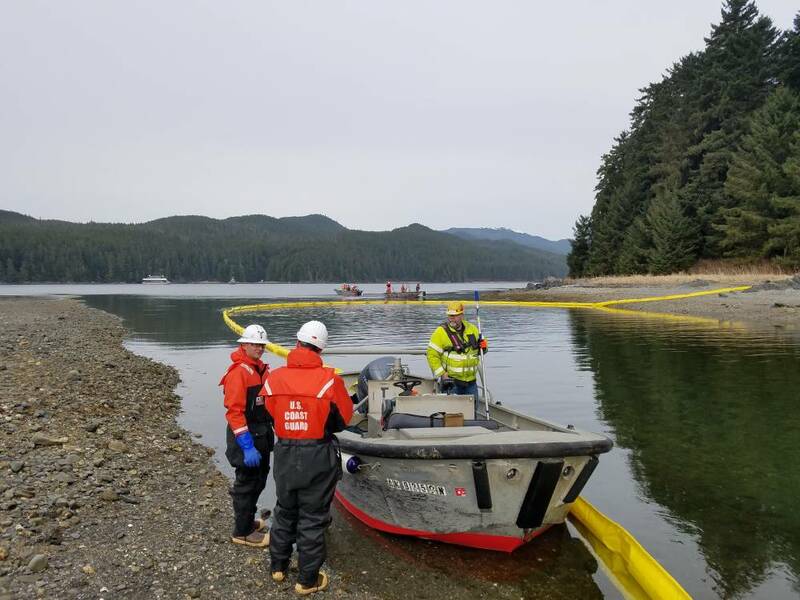 On Wednesday, April 3 first responders deployed hundreds of feet of boom in Hawk Inlet to contain the hypothetical spill near the mine. Coast Guard Commander Michael Kahle acted as the chief federal incident commander. Downstairs from the incident command room, a situation room is humming with activity. Dozens of officials from state and federal agencies are role playing with each other to come up with the next plan of attack. Kathy Hamblett is the Coast Guard’s Sector Juneau civilian coordinator for contingency and planning. These regional simulations are run every four years. And she’s been through a few of them. The last one was in Sitka. “We were using a scenario that involved a collision and fishing vessels during this sac-roe herring fishery,” she recalled. The year before that involved industrial sabotage. Fortunately, there hasn’t been an oil spill of this scale in living memory in Southeast. But these exercises are useful. Alaska Department of Environmental Conservation’s spill response team’s David Pikul acted as the state’s incident commander. The largest spill he can recall was in 2017. Once the war gaming is complete, Kahle said it’ll be time to debrief. If this were an actual spill it wouldn’t just be the state and feds responding. Hecla Greens Mine spokesman Mike Satre said the mine maintains its own spill response gear and took part in this drill. “And so we stand ready to assist anyone in Southeast Alaska just as other assets in Southeast are ready to assist us if we have an issue,” Satre said. A formal report is expected in June. That’ll be used for state and federal emergency responders to plan for the next real spill in Southeast Alaska.